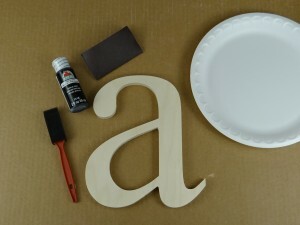 This tutorial will help you learn how to paint wooden letters in no time. While painting may look intimidating, it really isn’t that difficult if you take your time. 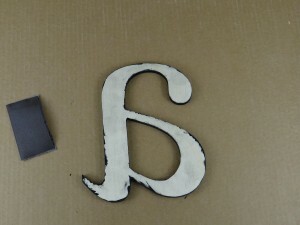 This tutorial is for finishing baltic birch wooden letters. MDF wooden letters is very similar, except the edges need to be sealed using Mod Podge or a good primer (I personally find Mod Podge works better). Brush – I used a foam brush. Any brush will work. 1 – Put the cardboard or paper down to protect your work area. Lay out your supplies. 2 – Sand the letters on the edges and faces. Using the paper towel, get it slightly damp (is really doesn’t take much) and wipe the dust off the letters. 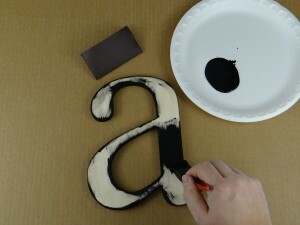 Allow the letters to dry before proceeding to painting. 3 – Dispense some paint (or if the container is big enough for the brush, just have it open). It is easier to have less paint as you can always put some more on the plate. 4 – I find it easier to paint the edges first. Smooth out any build up of paint that may occur on the faces. This help with sanding later on. 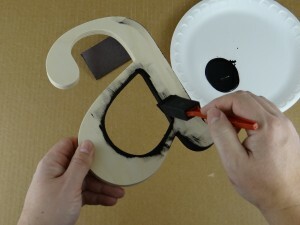 5 – Lay the letter down and paint the face, smoothing out build up on the edges as you paint an area. 6 – After the paint has dried, paint the back face. This may be option if you are putting the letters on a plaque for a sign. 7 – Sand the edges and faces. I used 120 grit sandpaper in this step. At this point, if you like the distressed look, you can stop here. You can also optionally add a coat of gloss Mod Podge for a shiny finished look. 8 – Apply another coat on the edges and faces and lightly sand with 220 grit sandpaper. After the paint has dried, you can now hang the letters or apply to a sign. We will soon have a tutorial on hanging letters. 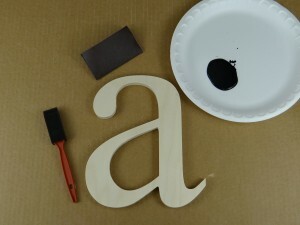 Don’t have time or patience to paint letters? 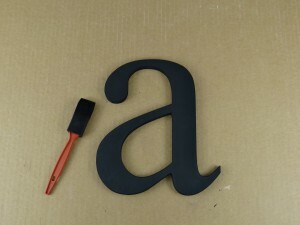 We also offer painted letters. 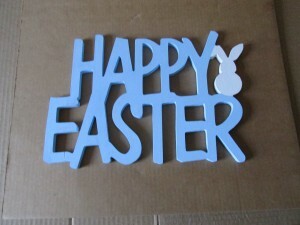 This Happy Easter sign is a perfect piece for decorating for the Easter holiday. Using cotton swabs to make the flowers makes this a quick and easy craft project. If you never painted any wood crafts before, we suggest you to read our basic tutorials to show you some good ideas and tips before proceeding with this tutorial. 1 – Gather all your supplies needed for this project. Layout the newspaper or cardboard to protect your work area. 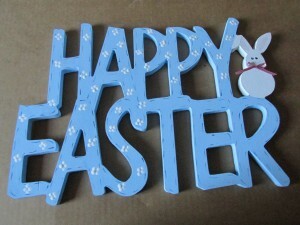 2 – Paint the bunny white and then paint the HAPPY EASTER a light blue. 3 – Using a cotton swab, dip the end in black paint and make two small dots for the eyes. Take some dainty ribbon, tie a small bow and hot glue it into place. 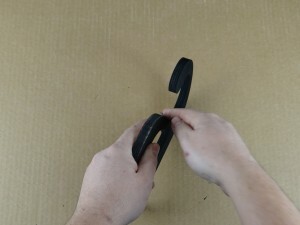 4 – Use a small brush with black paint and place the threads around the edges to make the stitching. Using another cotton swab, dip it in white paint and hold at an angle to make the flowers. 5 – After the flowers are done and dried, cut the cotton swab in half. Dipping the cut end into some yellow paint, apply dots to the centers of the flowers. 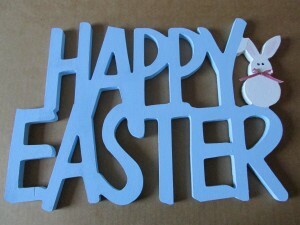 Your HAPPY EASTER sign is now complete! You can optionally tie a ribbon, use some wire or sisal rope for hanging your sign. If you purchased a smaller sign, it can be hot glued to a wreath as well. The ideas are almost endless! Looking for an Easter project to hang on your front door or just about anywhere? 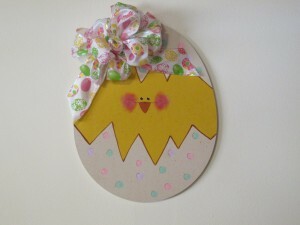 This cute little chick is peaking out a little early, but that’s alright by us! Just look at that face and we are sure your friends and family will love this as well. While this looks difficult to paint, it is actually quite easy if you follow this tutorial! 1 – Gather your supplies. Setup the cardboard or paper to protect your work area. 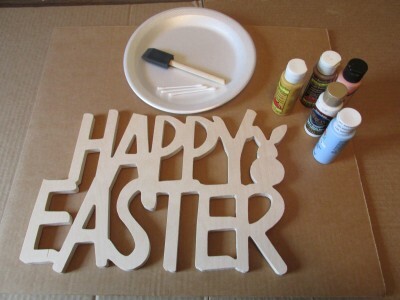 2 – We are going to paint a large wooden egg shape for a holiday wall hanging. First paint the egg either white or off white. I chose to paint this one with a mix of antique white and white. After painting the sides and top of the egg let it dry completely and then sand any drips or runs the paint may have left. 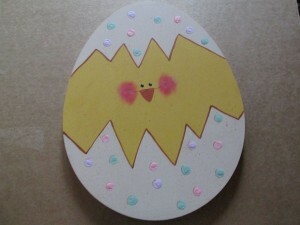 3 – With a pencil lightly draw a cracked egg shell pattern near the top and bottom of the egg. Paint the middle part yellow or gold. I chose Kings Gold on this egg. 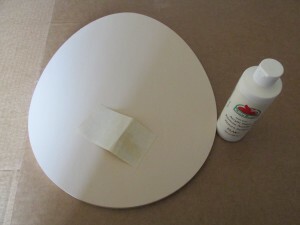 Then outline the cracked shape with a liner brush and brown or black paint. Add some water to a bit of brown paint, so it is like thin ink. Dip an old toothbrush in the thin paint, hold over the egg and flick the brush with your finger so that tiny drops of paint speckle the egg. 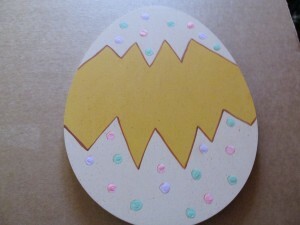 4 – With a 1/2 inch piece of dowel, or any round object about that size, make dots on the white part of the egg in Easter colors. I chose lavender, pink and light green. 5 – Outline one side of each dot with brown paint. This gives a dimensional look to the dots and makes them stand out. 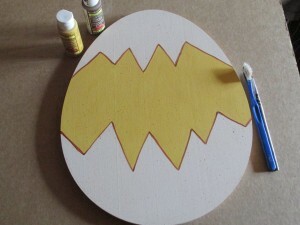 6 – Dip a q-tip in black paint and make two small dots near the center of the egg for chick eyes. Under the eyes paint an orange triangle for the beak. Using a fine liner brush make two small dots at the top of the triangle for the chick’s nose. At the top edge of the triangle make a small line for a mouth, also using the liner brush. Make small white dots on the black eyes, this gives eyes “life”. Dip a stencil brush in red or pink paint, dab it on a paper towel until most of the paint is gone. Then pounce the brush on the mouth lines on the chick’s face. 7 -This egg came with a keyhole in the back. If you have one that doesn’t you can nail a picture hanger to the back at this point. Next hot glue a bow to the hatching chick egg. 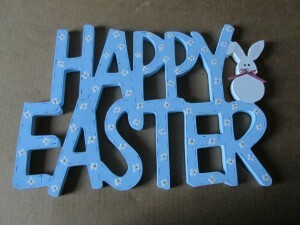 You now have a wonderfully whimsical Easter decoration to hang in your home and enjoy for years to come.